Panagiotis Gourlonis' miniature, handcrafted earrings spin just like life-sized pinwheels. As a young boy in Athens, Panagiotis Gourlonis remembers twirling the bright colored paper of a pinwheel. Years later, he's decided to turn a favorite childhood toy into something wearable. His charming designs are hand-folded origami style and attached to a sterling silver "wand." With a light twist, the pinwheels spin just like the real thing. A great gift for imaginative friends, the earrings are sure to inspire their child-like wonder. Handmade in Athens, Greece. When Panagiotis Gourlonis was a teenager he was charmed by the sparkling world of jewelry. As he got older, he surrounded himself with experts, traditional makers who taught him the intricacies and secrets of how to create one-of-a-kind pieces. Today, Panagiotis runs a small studio in Athens, Greece. He aims to create jewelry that feels surprising, innovative, and inspirational for the wearer. Wipe down with soft cloth only. The only small disappointment is that the pair does not spin as anticipated. I bought these for my mom's birthday and she loved them! 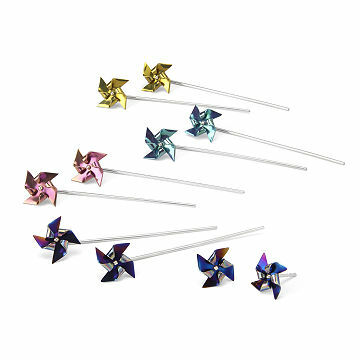 They come in a cute little box with a bow and the pinwheels even spin (although not when you're wearing them)! She had never seen anything like them before! These are adorable, but not life-changing. They don't spin feely, so the twirl factor is pretty much the same as any stud-style earring. I worry that they might be a little delicate and the ends will bend or break when I remove the backs, but so far, that hasn't happened.